From the first gun shot in Bomaru, Kailahun District, in 1991 the decade-long rebel war reached every corner of Sierra Leone leaving an unprecedented trail of destruction of lives and property in the country’s history. At the peak of the war Kailahun District recorded the most deaths. The infamous Slaughter House, where hundreds of innocent civilians including women and children were reportedly butchered in cold blood and in broad day light, still stands there at the center of the town. The stench of decayed human blood still fills the atmosphere around the war relic. From the first officially confirmed Ebola case in Kpondu village, Kissi Teng chiefdom, Kailahun District on 24th/25th May, 2014, the EVD touched every district in Sierra Leone, except perhaps Bonthe Island which, for reasons of ‘remoteness and God’s mercy’ according to the District Health Superintendent (DHS) there at the time, didn’t record any positive case during the outbreak. At the height of the Ebola outbreak in late June-July 2014, according to WHO, more than 80 new Ebola cases were reported per week in Kailahun; and more than 50 bodies were buried in just 12 days in makeshift graves close to the Ebola treatment center. ‘And this number did not include people who died in their homes’. But how do the people of Kailahun feel about the fact that they have literally been the launch pad for two of the biggest disasters to befall Sierra Leone in the last three decades? Hon PC Mohamed Sama Kailondo Banya IV doesn’t agree it is misfortune. Having been through all of that, one did understand why the people of Kailahun remained timid in the event of clocking past 42 days without recording any new Ebola case. The day had passed by quietly as just another day in that episode of their chequered history. Outside on the red dusty streets there were pockets of people here and there. The general mood was one of a people in great pain. A people hurt by their own misfortune and years and years of neglect by successive governments. In the 2007 Presidential run-off election the National Electoral Commission (NEC) Chairwoman, Dr. Christiana Thorpe, announced the cancellation of results from a total of 477 polling stations in Kailahun, a controversial decision that sealed the defeat of the then ruling Sierra Leone People’s Party (SLPP)-led government and their arch rivals the All People’s Congress claiming victory. 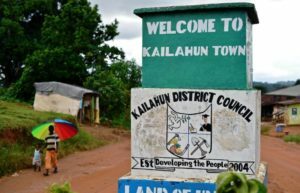 In our political Geography, Kailahun is regarded as one of the strongholds of the SLPP. Conversely, in the just concluded presidential run-off election (31st March, 2018) the 134, 064 votes from Kailahun were the decisive quantity that handed victory to the SLPP after 10 years in opposition and the APC losing out. With all the troubles this district has been through, the people of Kailahun should not be searching for development; it is development itself that should find them. And the road to that development has come as close as Pendembu (work is in progress), only 17 horrible miles more to the district headquarter town of Kailahun.